As stated by the Bank for International Settlements, the foreign exchange market is the biggest financial market in the whole world as it has daily a turnover ranging about 5 Trillion US dollars. The FX spot market adds up to the most trades held daily and also is the most used product for foreign exchange. Most of the spot trades are conducted either between financial institution duos or even between a financial institution and a company. A spot trade can best be referred to as a binding duty to either sell or buy a foreign currency which is intended to be delivered immediately at the most recent price and that is referred to as the Spot Exchange Rate. However, the trades often are completed with sometimes a two-day slight delay and then an agreement is held between the two parties saying that the current price at that time would still be that used when the settlement time reaches. That day which the execution of the spot trade is carried out is known as the Trade Date and the Settlement Date is the day for the physical exchange of the currencies. This is known as T+2 in the FX Industry and literally means the “trade day added to 2 more days”. In the foreign exchange market, most of their spot trades have their settlement two business days after when the trade was executed. The duos USDCAD are exempted from this as they are finalized at the next business day. Looking further, after the execution, the trade settlement can have delays if there is a holiday due to the reason that settlement dates are to be a normal working day in the two countries that have their currencies involved for the spot trade. Also, spot trades have their own drawbacks although they are the commonly used and easiest FX product used for quick execution. Now, if they depend on the spot rate for a later settlement, the two parties have themselves tied in a risk that is very significant due to the FX marketability to be highly volatile even within a single day of trading. Majorly, the difference between the futures and spot FX markets is the time the currency’s actual delivery is taking place. 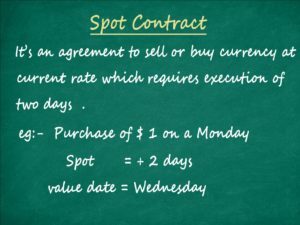 In a futures contract, the visible delivery is a date usually after a long while afterward but in the spot FX contract, the delivery occurs exactly at the same time of trading or a little time afterward. The demand and supply of the currency can determine the spot contract’s rate of exchange. Now, there are a set of factors which can affect supply and demand and they include expected and the current rate of interest of the country, the rate of inflation, foreign and domestic interest rates differences etc. 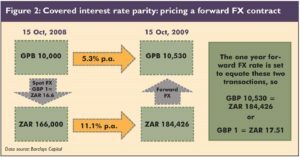 Now, the foreign and domestic interest rates in Forex are a very vital factor which affects futures and forwards pricing. In order to get a hint of future rest place of spot prices, traders do track interest rates differences and also futures prices. There are also a number of markets dealing with finance which also in the spot market make trades aside from the market of foreign exchange. Their own products of interest rates e.g. options and bonds are finalized on the following day of business. Most of the trading of commodities is done for settlement in the future though commodities also, can as well on the spot market be traded. The means of Commodities trading are through exchanges which are regulated e.g. (i) The Intercontinental Exchange. (ii) The CME Group. Etc. Every Friday by 2:30 PM on EST timing, the report of Commitment of Traders (COT) is usually drawn up by the commission for the US Commodity Futures Trading and it produces a collection of short and long futures positioning on a certain count of commodities and securities which have been undertaken by traders either non-commercial or commercial or both. Also, possible purchasers of energy are connected with surplus energy producers by the Energy Spot Market. It allows to prices negotiations immediately and energy delivering within very few minutes. A few Energy Spot Market are listed hence: (i) Title Transfer Facility (TTF) located in Netherland. (ii) National Balancing Point (NBP) located in the British United Kingdom. Accounting for most of the daily turnover is done by the FX spot market which is the major product for FX trading. This explains that for quick delivery, securities, commodities, and currencies are hence traded, but in the futures market, it is at a future date that delivery has its scheduled. Also, there are other various spot markets which include energy products, future markets, bonds and commodities in exchange trades apart from the FX Spot Market which has their trade done over the counter.